In the early days of Oak Bluffs, visitors travelled by steamboat to Lake Anthony (Oak Bluffs Harbor) and the campground area surrounding a large tent was the site for Methodist revivals. The worshippers in the “camp meetings” had become very concerned about the influx of summer visitors who spent their time at the beach, walking on Circuit Avenue, relaxing and having a good time. To them, camp meetings were to be serious, highly religious and separate from the worldly influences. In a 1958 history editorial in the Vineyard Gazette, it was reported that “.. the new community of the Oak Bluffs Land & Wharf Co. was being called ungodly.” To further prove the disdain felt by the worshippers in the campgrounds, in 1867, the camp meeting organizers erected a seven-foot picket fence around the campground that closed each evening at 10:00 PM. As the summer population grew, the developer (Oak Bluffs Land and Wharf Co.) realized that vacationers were lacking a place to worship, and contracted to build a church. Union Chapel was built in 1870 as a non-sectarian worship space in an area dominated by the Methodist summer camp meeting known as Wesleyan Grove. The architect commissioned for the project was Samuel Freeman Pratt, a renowned local architect. The chapel was built in a beautiful octagonal shape on a small rise of land called Chapel Hill at the intersection of Circuit, Narragansett, and Samoset Avenues. Mr. Pratt is estimated to have designed twenty-two structures in the young town of Oak Bluffs including the gateway to the Wharf and the Seaview Hotel. The chapel took one year to build, completing in 1871, seating 800 with a spire reaching an altitude of 96 feet, and a final construction cost of $16,000. The chapel was open to its first service in August, 1871.
denominations and first class music, but political events as well. It was in Union Chapel that meetings were held that led to the secession of Oak Bluffs from Edgartown in 1880. 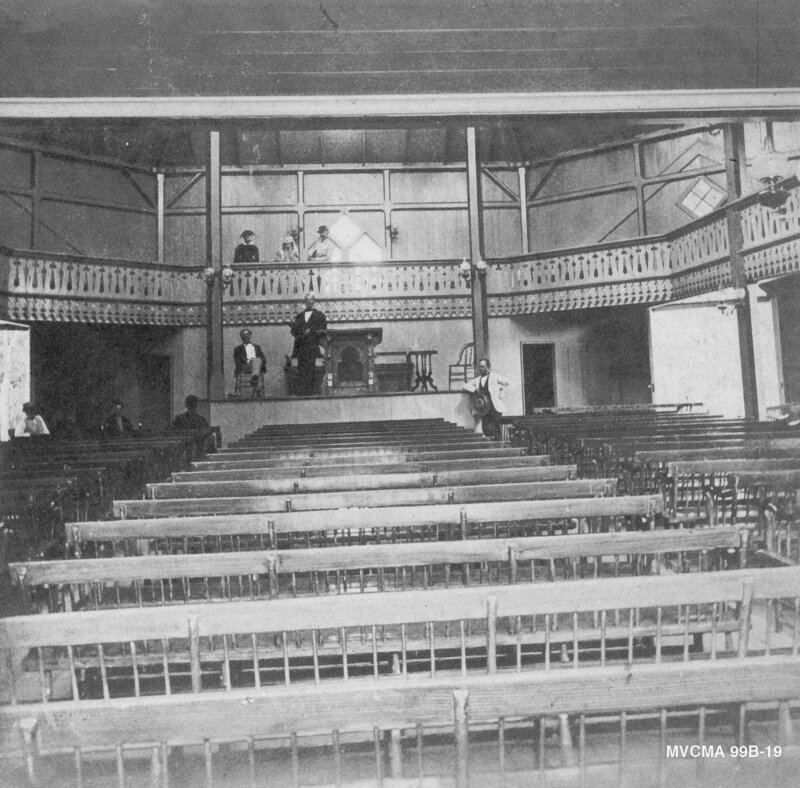 After secession, the Chapel hosted town meetings and high school graduations for a number of years and has been referred to as the center of the Oak Bluffs community. Union Chapel continues to provide interdenominational services each Sunday of the summer season. It is governed by a Board of Trustees and everyone who attends service is considered to be a member.